Typically, as months pass, I get nest-antsy. I start to detest the way rooms are set up and decorated and need a change. Even something a simple as swapping out pillows, moving items from one room to another will do it. While I love to rearrange furniture, when you are limited on where things can go, the small changes go a long way. I hated my mantle set up. Too much clutter and not enough cute. I decided that cleaning it up would have to make me feel better, so down it all came. When reassessing a space, "use only what you love" (thanks TM!). I have so many things I love that it is hard to choose. However, this "problem" (if you can call it that) also works to my advantage as I can always move things around and re-fall in love with forgotten treasures. I decided to bring back my love of the hanky banner as my "focal piece". I then asked my Thriving Mommy to help me with a vintage hanky banner as she is a pro and I wanted to use the height of our fireplace area to my advantage. She, as always, dropped everything to assist in making my design dreams come true. For a little "hanky banner" DIY party of your own, all you need is some of your favorite vintage handkerchiefs (we are always on the look out for the cheapest, prettiest ones we can find at garage/estate sales and consignment stores) and ribbon. Decide how you want them displayed, iron each one so it is nice and crisp, fold them in triangles over the ribbon and add a stitch to hold it in place (that part is optional but really makes a difference...especially if you want to hang your banner where there may be a breeze). Once you have decided on a focal piece, start adding your favorite things so each time you eye the mantle, you smile. For me, I decided this time to scale it back. I wanted just a few things that meant a lot to our family and otherwise, good ole' "negative space" (Thank you Shell for making me love that term). My Thriving Husband is an absolute dream when it comes to his desire to decorate. He has none. He lets me do whatever I want and even better, notices next to nothing. I love that he lets me have my "girlie" touches and only weighs in if I go off the deep end...like if I wanted a pink fuzzy couch or something. As I am obsessed with making my own wood work, I decided to bust out a "Home Sweet Home" creation with an EST. date reflecting the year we bought our forever home. I loved that it was simple, had gold script to play off the extinguishers and personalized to our family. 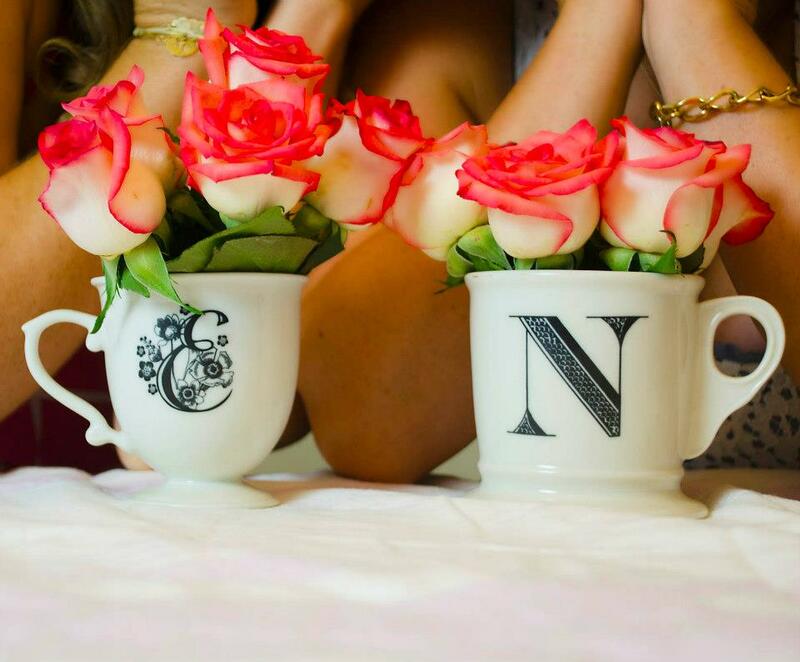 Throw a little pop of color behind it with some fresh flowers and BOOM, I was lovin' that side of the finished product! On the other corner, I decided to use one of my favorite, smaller suitcases, keep it open and fill it with old books and a shimmery-shiny hurricane. As I am a frequent candle burner, I felt this particular treasure was perfect as it casts beautiful dancing gold glints of glitter when the candle is lit. I felt it would be a really brighten up and add some sparkle to the old case. Now what to do about center stage? Hmmmmmm. Since I proudly display all my family pictures on a focus wall, I don't like to have them anywhere else...including the mantle. But, I do LOVE my scrabble-esque, handmade wooden letters spelling my last name. So, I decided they would be nestled below that hanky banner bringing it all together. When I stood back to check it out, that nest-xiety was gone! I felt refreshed, the rest of the room no longer seemed to drag me down as this corner of new-ness added that much needed pep in my home lovin' step. I felt it was simple yet busy. Flashy yet classy and mixed just the right touch of masculinity to this girly girl's taste. I was very pleased with the end result! 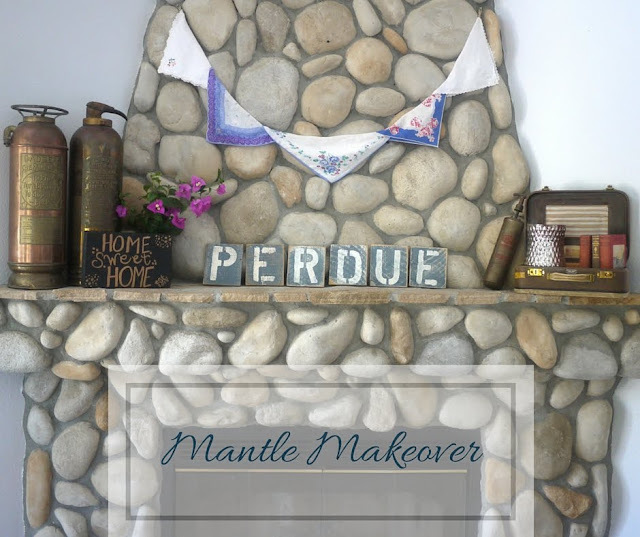 So, when you feel the need for a mantle makeover, remember to always start and end with what you love. Keep it simple and showcase your favorite things. The best part is, you can always redo it in a few months when you start to need a room refresher! What do you love to display around your home?